RSA Marketing Canada wrote, designed and produced the TESC brand identity, branding guide, marketing brochures, motivational posters, calendars, advertising, signage, tradeshow booth and website. 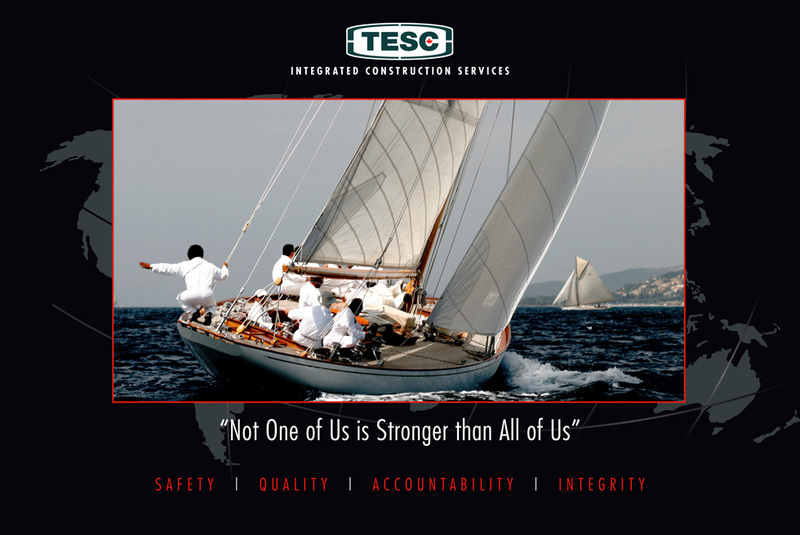 TESC Contracting Company Ltd. is a multi-disciplined contracting company offering integrated, single-source and responsible construction services to industrial, institutional and commercial clients for over 30 years. TESC is a growth-driven company who design, build and maintain plant and equipment for their valued partner customers, anywhere in the world. Established in 1995, Rob Stonehewer & Associates has been a long-term preferred supplier to American Express Canada and worked with Fortune 1,000 companies such as AT&T/Allstream, Qualcomm, Sun Microsystems and Castrol, as well as many small to mid-size companies including Archmill House, Burlington Chamber of Commerce, CADA (Canadian Auto Dealers Association), Cogeco Cable, TESC Contracting and Thordon Bearings.